The editing capabilities found in YouTube's back end aren't going to compete with nonlinear editors like Apple Final Cut Pro or Adobe Premiere Pro, but there are some powerful and unique tools that can make simple editing projects even simpler. As video pros, we don’t often consider YouTube a viable option for postproduction. But there are a surprising number of features found under the site’s Creator Studio that can be useful time savers. The editing capabilities found in YouTube’s back end aren’t going to compete with nonlinear editors like Apple Final Cut Pro or Adobe Premiere Pro, but there are some powerful and unique tools that can make simple editing projects even simpler. It’s worth pointing out from the very beginning just where to find YouTube’s Creator Studio. After logging into your account, click on your profile image at the top-right of the browser window. Here you’ll find the Creator Studio button, which takes you to the page containing the videos on your channel, performance analytics of your videos, live-streaming setup, and numerous other settings-related menus (Figure 1, below). 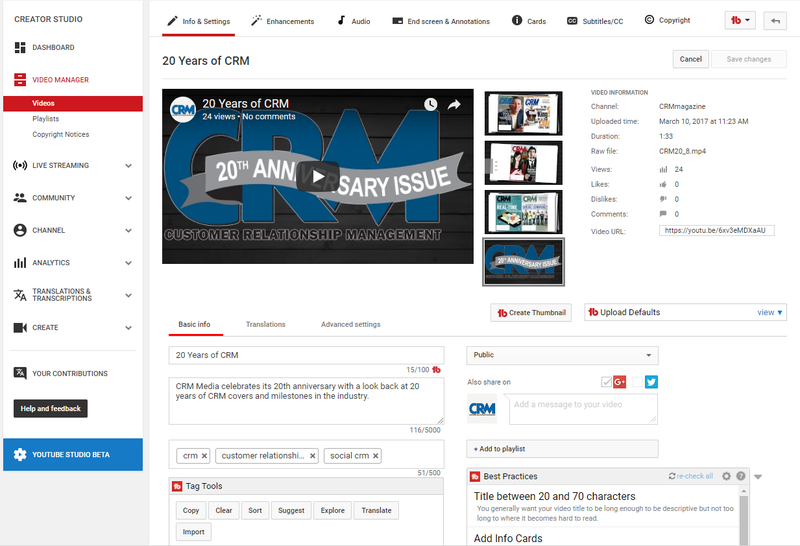 At the time of this writing, YouTube has a new version of the Creator Studio, called YouTube Studio, in beta. The beta Studio is still missing most of the features available in Creator Studio, so I did not consider it when writing this article. Figure 1. 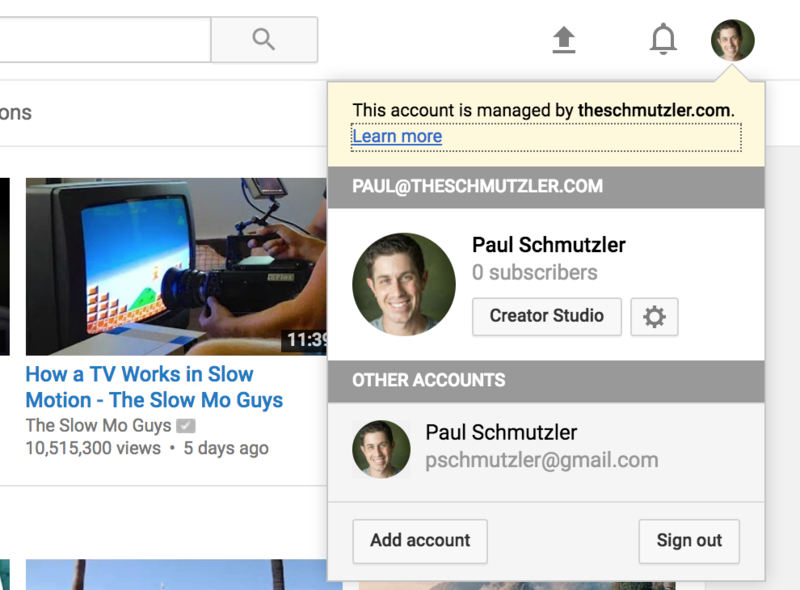 Access YouTube Creator Studio here. Calling the Creator Studio an editor is a bit of a misnomer. While you can “edit” your videos in the most technical sense, you cannot perform a lot of traditional edits such as combining multiple clips, adding transitions, or balancing audio levels. You need to plan on starting with a finished video that may just need some basic enhancements or corrections. Here’s what you can do, and here’s how it may be most helpful as a time-saving tool. Creator Studio makes it easy to add music to a video. 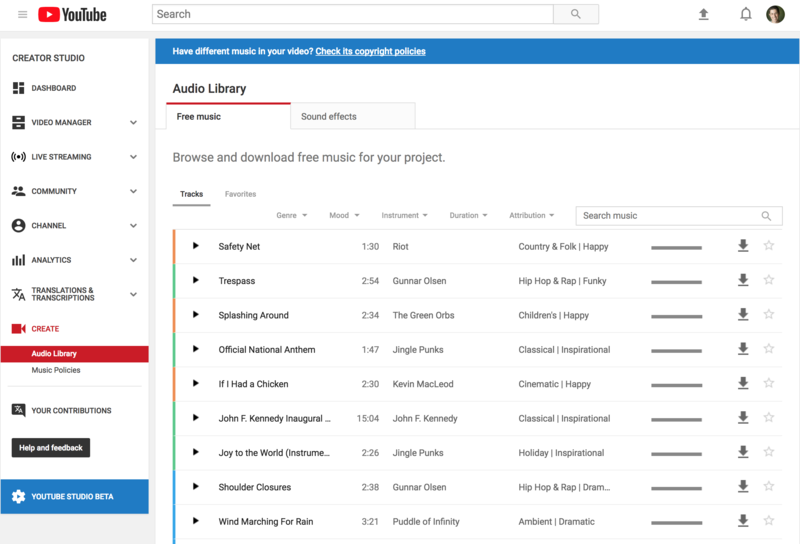 Under the Create menu, you’ll find the YouTube Audio Library (Figure 2, below). This library is searchable and sortable, allowing you to quickly preview tracks to use in your productions. These tracks can be instantly downloaded for offline incorporation into your video, or they can replace an already-uploaded video’s audio track. To replace the audio on a video that’s already on your channel, go to the Video Manager and use the Edit button next to each video. 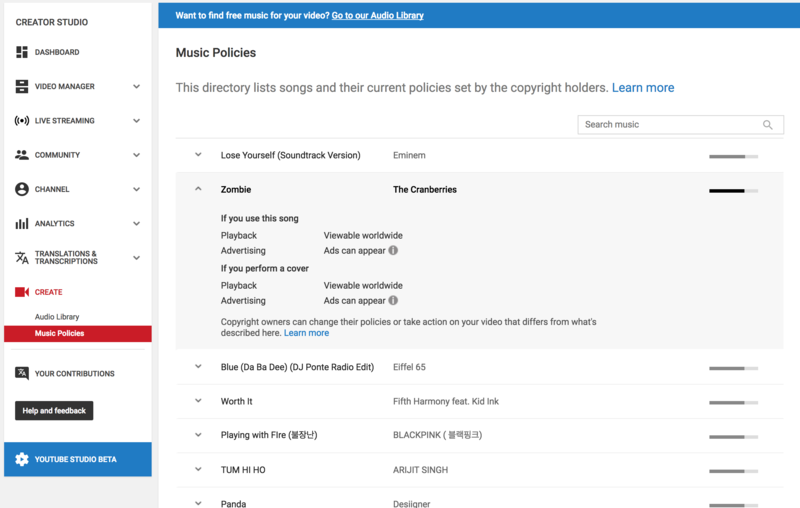 Also, under the Create menu, be sure to check out the Music Policies tab, which lists popular songs that users may choose for their videos (Figure 3, below). Information included with each track specifies whether your video can be played worldwide and if ads can be shown alongside it. There’s also a disclaimer warning the user that artists may change their policies at any time. The message is clear: Use these songs at your own risk. 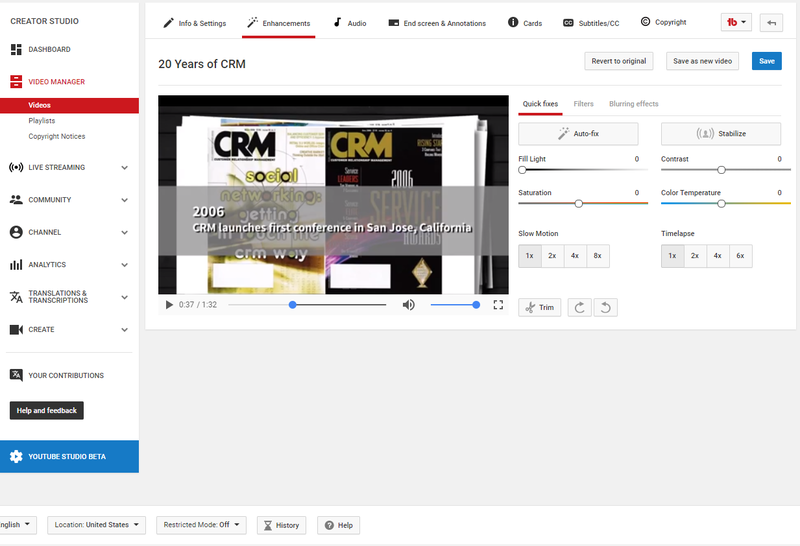 Looking under the Video Manager again, you’ll find the rest of the editing options for your videos. The first tab, Info & Settings (Figure 4, below), allows you to customize the thumbnail shown with your video; edit the title, description, and tags; add it to a playlist; and share it on Twitter automatically. Note that you can upload a 2MB file to provide your own custom thumbnail for a video if you don’t like the options that YouTube automatically selects for you. For anyone who’s ever clicked on a video and found that the thumbnail was completely misleading, this will answer a lot of questions. The next tab over, Enhancements, includes many predictable adjustments like saturation, color temperature, and contrast (Figure 5, below). However, there are some surprisingly capable features here that shouldn’t be overlooked. There’s a stabilizer for shaky footage and an Auto Fix button to quickly improve what may be a poorly colored video. Under Filters, you’ll find a number of prebuilt “looks” that you can apply. Finally, Blurring Effects allows you to blur out faces for privacy or use custom blurring if you need to hide brands or offensive imagery.